WHEN the French-founded religious congregation, the Sisters of the Sacred Heart of Jesus, decided to establish a new mission community in Papua New Guinea 20 years ago, the vast majority of the sisters had never heard of the place, nor did they know where to look for it on a map! 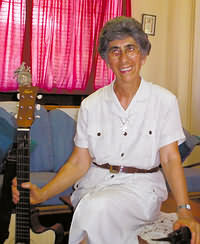 Sr Mary Claude was a member of that first mission community to PNG. Sr Mary Claude will visit the Archdiocese of Brisbane next week as part of Caritas Australia’s annual Lenten campaign, Project Compassion. A proud Texan with a background in education and hospital chaplaincy, Sr Mary Claude admits that her “life changed forever” when she arrived in PNG with six other sisters in 1986. “Everything I thought I knew and had done before coming to PNG had no relevance whatsoever to what I was being asked to do as a missionary in the service of a young Church, in a young developing country,” she said. Twenty years on, Sr Mary Claude has become very familiar with PNG, the land and its people, its beauty and its challenges. Her first 14 years were spent in the highlands working in the Diocese of Kundiawa. In 2000 she moved to the Archdiocese of Madang on PNG’s north coast, where she now lives. In both dioceses Sr Mary Claude has played a vital role in establishing administrative structures and co-ordinating pastoral support facilities in collaboration with the local people. Justine McMahon, Caritas Australia’s Pacific Programs co-ordinator, says Sr Mary Claude is widely respected by the PNG people and those in the Church. She describes her as very prayerful, a generous and tireless worker, with a good sense of humour. Sr Mary Claude acknowledges that working for a “young” Church in a “young” developing country is rewarding but hard and stressful work. She names many challenges but the biggest task for her is “how to help the people of PNG move forward in the 21st century, to develop as a people, Church and nation, but at their pace, and according to their own cultural traditions, well adapted and integrated in the rest of the world”. She adds, “We know that we are here not for ourselves, but for them, and the more we help them become who they can be, the more joy there is for us. “Capacity building through transfer of skills is uppermost in our mind. Localisation is extremely important. In early 2005 Sr Mary Claude’s role was unexpectedly broadened to include humanitarian relief work when two volcanic eruptions on Manam Island (north of Madang town) forced the evacuation of nearly 10,000 people to mainland PNG. While there were no deaths directly as a result of the displacement, the islanders were left without their homes, a food source, health and education facilities and the ability to sustain their lives. According to Sr Mary Claude, for many, being evacuated to the mainland was “like being taken to a foreign country”. Although a small number have been able to return to their island homes, the majority are living in camps (or care centres) along the Madang North Coast Road at Mangem, Asuramba and Potsdam. “Thanks to Caritas Australia, working in partnership with the Archdiocese of Madang, their situation has greatly improved,” says Sr Mary Claude. As a result of this partnership people in the care centres have been provided with education and health facilities as well as trauma counselling. Caritas Australia has also supported a project to retrieve canoes and fishing gear from Manam Island so that people are able to source their own food. But the future of the Manam Islanders appears uncertain. Sr Mary Claude believes that most will never be able to return to their homes because of the devastation caused by the eruptions. “I suspect that the Manam Islanders will stay right where they are for many years to come. More land elsewhere does not seem to be readily available because it already belongs customarily to some other Papua New Guineans who prefer not to dispose of it,” she explains. Negotiations for suitable land are ongoing but it is unlikely that this complex issue will be resolved quickly. In the meantime, Caritas Australia continues to work with the Archdiocese of Madang to support the needs of the Manam Islanders who have been left homeless by this emergency. When asked what message she would like to convey to Australians, Sr Mary Claude overflows with warmth and gratitude. “Look at all the good that has been accomplished thanks to your generosity! “We have done the leg work, we’ve been the eyes, the ears, the hands and the feet of Caritas, and you, through Caritas, have been the heart, giving us support and encouragement that kept us going in goods times and in bad. Sr Mary Claude will attend the Brisbane launch of Project Compassion on March 1 and address parishes and schools in the archdiocese before leaving on March 6.